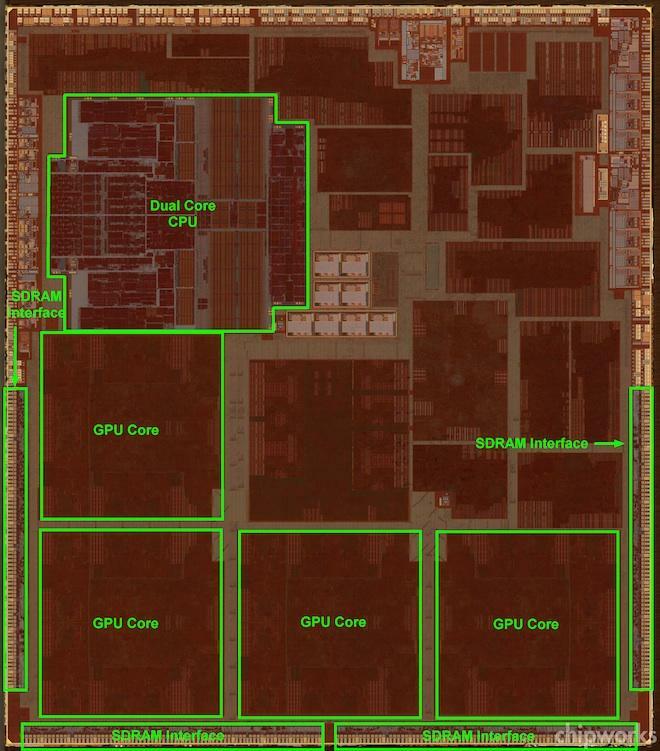 The performance of Apple's fourth-generation iPad has received a significant boost thanks to the PowerVR SGX 554 graphics processor hidden inside its new A6X chip. The GPU, detailed by AnandTech, is a significant upgrade from the PowerVR SGX 543MP4 found in the third-generation iPad released earlier his year. Total GFLOPS at 300 megahertz have doubled from 38.4 in the third-generation iPad to 76.8 in the latest iPad. "Ultimately it looks like the A6X is the (system on a chip) that the iPad needed to really deliver good gaming performance at its native resolution," author Anand Lal Shimpi wrote. "I would not be surprised to see more game developers default to 2048 x 1536 on the new iPad rather than picking a lower resolution and enabling anti-aliasing." The A6X was also dissected by the silicon experts at Chipworks which called the chip "a very new beast." They found that the A6X is "not just an A6 with a couple minor tweaks," but is a full 30 percent larger than the A6 chip found in the iPhone 5. The extra space went to the graphics processing cores, which have been increased from three to four. These GPU cores are also said to be much larger, while the CPU is sized the same size as the one found inside the A6. Using a high magnification scope, Chipworks looked even closer at the four GPU cores in the A6X and found that each is actually split into 9 sub-cores: two sets of 4 identical sub-cores, plus a central one. "This could be done to allow for more efficient parallel processing, or to allow for a higher maximum clock rate," the said. "In either case, these GPUs should result in some blazing graphics on your iPad. They also found that the A6X has double the SDRAM interface of the A6, and that all of the digital cores other than the CPU have redesigned layouts.